The awe-inspiring 292 bone structure is being delicately unpacked by a team of specialists who are tasked with piecing together the iconic dinosaur cast. 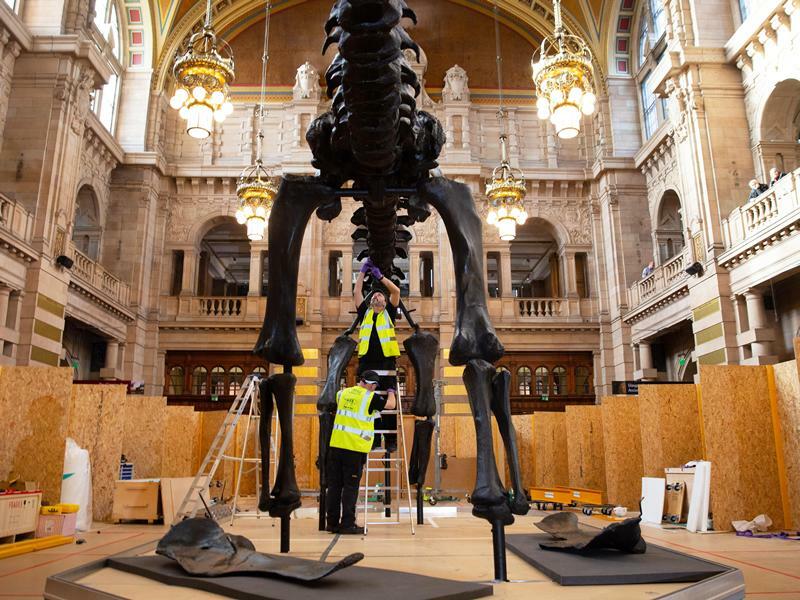 In a Dippy on Tour first, Scottish audiences can watch the transformation from giant jigsaw to an impressive 21.3 meter long diplodocus take shape from the balcony in Kelvingrove Museum. The Natural History Museum’s Head of Conservation, Lorraine Cornish said: ‘As Dippy on Tour approaches the half-way point, having proved a huge success at the first three destinations, it seems very fitting that the next stop is a homecoming of sorts. The Scottish leg of the tour, where the creation of the NHM Dippy cast was first discussed, is the perfect destination to reflect on the many people Dippy has so far inspired to explore their own natural world. We hope the visitors to Dippy in Glasgow will be equally enthralled by this Jurassic ambassador’. As the UK tour hits the half-way point, the iconic dinosaur will be in Glasgow until 6 May 2019 and is free to visit. Before the tour, which has already delighted record-breaking numbers of visitors at three previous venues across the UK, Dippy had never been on public display outside of London. Kelvingrove Museum is the only Scottish destination on the tour. Diplodocus carnegii is named after Andrew Carnegie, the Scottish-American steel magnate and philanthropist who financed its excavation in Wyoming, USA in 1899. It was to become the centrepiece of The Carnegie Museum of Art in Pittsburgh. King Edward VII saw a sketch of the dinosaur while visiting Andrew Carnegie at his Scottish castle, Skibo and began a conversation that resulted in the commission of a replica cast. Dippy, as he became known, was unveiled at the Natural History Museum in 1905, where he remained one of the most popular exhibits until preparations began for Dippy on Tour in 2017.